Within Turkey Promotion Project for Gulf Countries of The Republic of Turkey Prime Ministry Investment Support and Promotion Agency (ISPAT), a group that is consist of around 10 social media phenomena of Gulf Countries visited Bursa Uludağ where still skiing season is still ongoing. In Bursa, where you can experience four seasons, through continuation of heavy snow in March, skiing season in Uludağ extended to March. Bursa that is one of the cities with high variety of tourism in Turkey, with its climate, geographical location and landscape, attracts every year high number of tourists arriving from Gulf countries. The group of social media phenomena, with around a million followers, that started their Turkey visit in İstanbul preferred to continue their visit by Bursa Uludağ. The delegation, that was hosted by BEBKA Bursa Investment Office, had opportunity to experience snow and winter season in Uludağ. In Bursa, that has the longest cable car line in the world, the delegation came across the unique panorama of Bursa and snow while climbing up to Uludağ by teleferic during ongoing heavy snow. Uludağ, with its 2543 m height, the highest mountain of Marmara Region in Turkey, the delegation of Gulf countries enjoyed the snow at the altitude of 1865 m and in the temperature of -6 oC in Zone 1 of hotels. 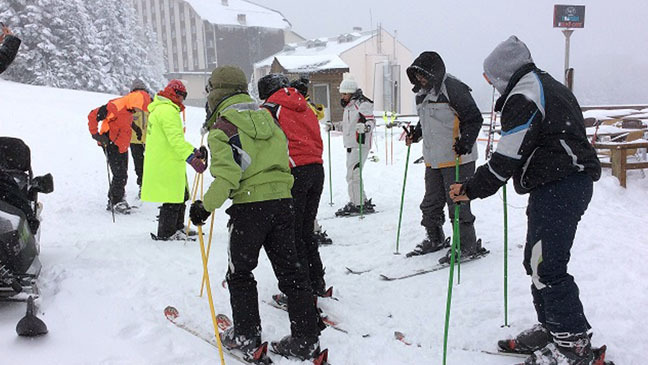 The delegation also took their first step to skiing sport by taking skiing lesson from experienced skiing trainers and had an interesting experience. The delegation with young members took photographs and broadcasted instantly over social media. They also shared their experience in Uludağ simultaneously with their numerous followers. In our times, where social media is the most effective promotion means, in the visit of which target is reaching wide and young population, positive feedbacks regarding the promotion is expected.